I joined Google in January 2017. This homepage is seldom updated. Please visit my scholar or linkedin page. I am currently a Postdoc researcher at the Department of Computer Science of Sapienza University of Rome and member of the Green WSN Group of the SEnsors NetworkS and Embedded Systems (SENSES) laboratory. I got my PhD in Computer Science from Sapienza University in 2013, under the supervision of Chiara Petrioli. During my PhD, I was supported by the 2010 Google European Doctoral Fellowship in Wireless Networking. My research interests lie in the field of green and energy-efficient sensing systems, with an emphasis on energy-harvesting and radio-triggering techniques for wireless sensor networks and on resource allocation and tasking for environmental and structural monitoring. I have been part of the organizing and technical program committee of over a dozen international conferences in the field of Wireless Sensor Networks. I am the PI of two Sapienza research grants for young researchers on green sensing systems. Giuseppe Ateniese, Giuseppe Bianchi, Angelo T. Capossele, Chiara Petrioli, and Dora Spenza, Low-cost Standard Signatures for Energy-Harvesting Wireless Sensor Networks. In ACM Transactions on Embedded Computing Systems, 2016. This work is motivated by a general question: Can micro-scale energy harvesting techniques be exploited to support low-cost standard security solutions on resource-constrained devices? We focus on guaranteeing integrity and authentication in Internet of Things (IoT) and Wireless Sensor Network (WSN) applications. In this paper we propose techniques to make ECDSA signatures low cost and implementable on resource-constrained devices. By combining precomputation techniques and energy harvesting capabilities of modern sensor nodes, we achieve significant improvement over prior works. In addition, we show the cost of ECDSA signatures can be reduced of up to a factor 10 by using harvesting-aware optimizations. Alessandro Cammarano, Chiara Petrioli, and Dora Spenza, Online Energy Harvesting Prediction in Environmentally Powered Wireless Sensor Networks. In IEEE Sensors Journal, Volume 16, Issue 17, pp. 6793 - 6804, Sep 2016. The increasing popularity of micro-scale power-scavenging techniques for wireless sensor networks (WSNs) is paving the way to energy-autonomous sensing systems. To sustain perpetual operations, however, environmentally powered devices must adapt their workload to the stochastic nature of ambient sources. Energy prediction models, which estimate the future expected energy intake, are effective tools to support the development of proactive power management strategies. In this paper, we present profile energy prediction model (Pro-Energy), an energy prediction model for multi-source energy-harvesting WSNs that leverages past energy observations to forecast future energy availability. We then propose Pro-Energy with variable-length timeslots (Pro-Energy-VLT), an extension of Pro-Energy that combines our energy predictor with timeslots of variable lengths to adapt to the dynamics of the power source. To assess the performance of our proposed solutions, we use real-life solar and wind traces, as well as publicly available traces of solar irradiance and wind speed. A comparative performance evaluation shows that Pro-Energy significantly outperforms the state-of-the-art energy predictors, by improving the prediction accuracy of up to 67%. Moreover, by adapting the granularity of the prediction timeslots to the dynamics of the energy source, Pro-Energy-VLT further improves the prediction accuracy, while reducing the memory footprint and the energy overhead of energy forecasting. Thomas La Porta, Chiara Petrioli, Cinthia Phillips and Dora Spenza, Sensor-mission assignment in rechargeable wireless sensor networks. In ACM Transactions on Sensor Networks, Volume 10, Issue 4, Article 60, June 2014. Sensor mission assignment involves matching the sensing resources of a wireless sensor network (WSN) to appropriate tasks (missions), which may come to the network dynamically. Although solutions for WSNs with battery-operated nodes have been proposed for this problem, no attention has been given to networks whose nodes have energy harvesting capabilities and are powered in part by uncontrollable environmental sources, which impose quite a different energy model. In this paper we address this problem by providing both an analytical model and a distributed heuristic, called EN-MASSE, specifically tailored for energy-harvesting mission-centric WSNs. To assess the performance of our proposed solution we have interfaced TelosB nodes with solar cells and performed extensive experiments to derive models and traces of solar energy acquisition. We use such real-life traces in our simulations. A comparative performance evaluation between EN-MASSE and other schemes previously proposed in the literature has shown that our solution significantly outperforms existing energy-harvesting-unaware mission assignment schemes. Moreover, using our analytical model as a benchmark, we also show that the profit earned by EN-MASSE is close to the optimum. Finally, we have implemented our proposed solution in TinyOS and experimentally validated its performance, showing the effectiveness of our approach. Danilo Porcarelli, Dora Spenza, Davide Brunelli, Alessandro Cammarano, Chiara Petrioli and Luca Benini, Adaptive Rectifier Driven by Power Intake Predictors for Wind Energy Harvesting Sensor Networks. In IEEE Journal of Emerging and Selected Topics in Power Electronics, vol.3, no.2, pp.471-482, June 2015. This paper presents a power management technique for improving the efficiency of harvesting energy from air-flows in wireless sensor networks (WSNs) applications. The proposed architecture consists of a two-stage energy conversion circuit: an AC-DC converter followed by a DC-DC buck-boost regulator with Maximum Power Point Tracking (MPPT) capability. The key feature of the proposed solution is the adaptive hybrid voltage rectifier, which exploits both passive and active topologies combined with power prediction algorithms. The adaptive converter significantly outperforms other solutions, increasing the efficiency between 10% and 30% with respect to the only-passive and the only-active topologies. To assess the performance of this approach in a real-life scenario, air-flow data have been collected by deploying WSN nodes interfaced with a wind micro-turbine in an underground tunnel of the Metro B1 line in Rome. It is shown that, by using the adaptive AC-DC converter combined with power prediction algorithms, nodes deployed in the tunnel can harvest up to 22% more energy with respect to previous methods. Finally, it is shown that using power management techniques optimized for the specific scenario, the overall system overhead, in terms of average number of sampling performed per day by a node, is reduced of up to 93%. Giuseppe Bianchi, Angelo T. Capossele, Chiara Petrioli, and Dora Spenza, AGREE: exploiting energy harvesting to support data-centric access control in WSNs. In Elsevier Ad Hoc Networks, Special Issue on Security, Privacy and Trust Management in the Internet of Things era (SePriT), Vol. 11. 2013, pp. 2625 - 2636. This work is motivated by a general question: can energy harvesting capabilities embedded in modern sensor nodes be exploited so as to support security mechanisms which otherwise would be too demanding and hardly viable? More specifically, in this work we focus on the support of extremely powerful, but complex, fine-grained data-centric access control mechanisms based on multi-authority Ciphertext Policy Attribute Based Encryption (CP-ABE). By integrating access control policies into the (encrypted) data, such mechanisms do not require any server-based access control infrastructure and are thus highly desirable in many wireless sensor network scenarios. However, as concretely shown by a proof-of-concept implementation first carried out in this paper on TelosB and MicaZ motes, computational complexity and energy toll of state-of-the-art multi-authority CP-ABE schemes is still critical. We thus show how to mitigate the relatively large energy consumption of the CP-ABE cryptographic operations by proposing AGREE (Access control for GREEn wireless sensor networks), a framework which exploits energy harvesting opportunities to pre-compute and cache suitably chosen CP-ABE-encrypted keys, so as to minimize the need to perform CP-ABE encryptions when no energy from harvesting is available. We assess the performance of AGREE by means of simulation and actual implementation, and by validating its operation with real-world energy-harvesting traces collected indoors by Telos B motes equipped with photovoltaic cells, as well as public available traces of radiant light energy. Our results show that complex security mechanisms may become significantly less demanding when implemented so as to take advantage of energy harvesting opportunities. Stefano Basagni, M. Yousof Naderi, Chiara Petrioli and Dora Spenza, Wireless Sensor Networks with Energy Harvesting. In Mobile Ad Hoc Networking: The Cutting Edge Directions, Chapter 20, pp. 701-736. John Wiley & Sons, Inc., Hoboken, NJ, 18 March, 2013. Giuseppe Ateniese, Giuseppe Bianchi, Angelo Capossele, Chiara Petrioli and Dora Spenza, HELIOS: Outsourcing of security operations in Green Wireless Sensor Networks. In Proceedings of IEEE VTC 2017 Spring, Sydney, Australia, Jun 2017. Energy-harvesting techniques for low-power embedded devices are opening up new opportunities for the design and optimization of security protocols for Green Wireless Sensor Networks. In this paper, we focus on scenarios where the energy resources of nodes in the network are heterogeneous, and propose a network-level solution that leverages the heterogeneity of harvesting capabilities to reduce the energy consumption of performing costly security operations. Our proposed distributed protocol, called HELIOS (Harvesting-EnabLed computatIon Outsourcing Scheme), allows nodes with scarce energy availability to outsource resource-demanding cryptographic operations to nodes that are harvesting power in excess, resulting in a significant reduction of their energy consumption. Angelo Capossele, Valerio Cervo, Chiara Petrioli and Dora Spenza, Counteracting Denial-of-Sleep Attacks in Wake-up-based Sensing Systems. In Proceedings of IEEE SECON 2016, London, UK, Jun 2016. Wake-up-radio-based sensing systems make use of radio-triggering techniques and ultra-low power wake-up receivers (WuRs) to enable on-demand asynchronous network wake ups. Thanks to this, they have the potential to achieve low latency data collection at minimum energy cost, thus meeting the challenging lifetime and quality-of-service demands of emerging Internet of Things (IoT) and Wireless Sensor Networks (WSNs) applications. However, the fact that nodes can be remotely activated on-demand makes wake-up-radio-based networks vulnerable to energy exhausting attacks. In this paper, with a focus on practical implementation and validation, we present a full-fledged solution to counteract Denial-of-Sleep (DoS) attacks to wake-up-radio-based sensing systems. A core component of our proposed solution is a key exchange protocol based on Elliptic Curve Cryptography (the Fully Hashed MQV protocol), which we use in conjunction with implicit certificates. 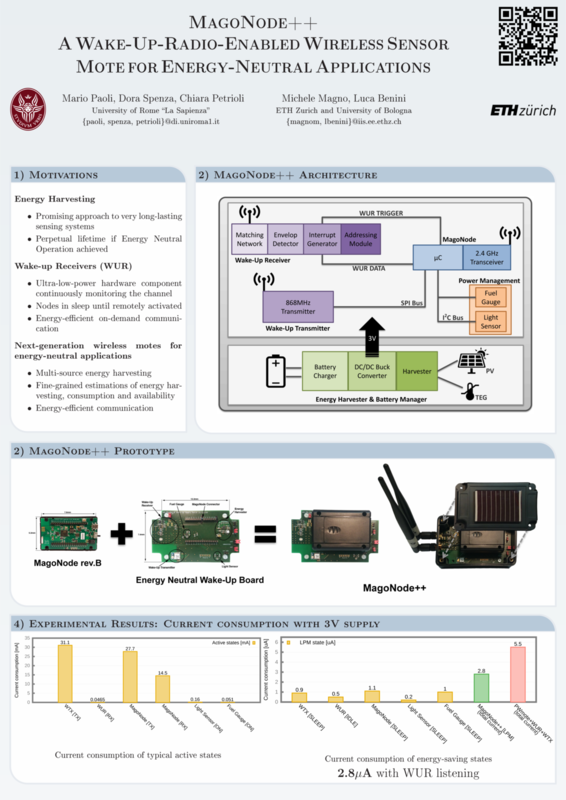 Mario Paoli, Dora Spenza, Chiara Petrioli, Michele Magno and Luca Benini, MagoNode++: A Wake-Up-Radio-Enabled Wireless Sensor Mote for Energy-Neutral Applications. In Proceedings of ACM/IEEE IPSN 2016 (Poster Session), Vienna, Austria, Apr 2016. The combination of low-power design, energy harvesting and ultra-low-power wake-up radios is paving the way for perpetual operation of Wireless Sensor Networks (WSNs). In this work, we present the MagoNode++, a novel WSN platform supporting energy harvesting and radio-triggered wake ups for energy-neutral applications. The MagoNode++ features an energy-harvesting subsystem composed by a light or thermoelectric harvester, a battery manager and a power manager module. It integrates a state-of-the-art RF Wake-Up Receiver (WUR) that enables low-latency asynchronous communication, virtually eliminating idle listening at the main transceiver. Experimental results show that the MagoNode++ consumes only 2.8uA with the WUR in idle listening and the rest of the platform in sleep state, making it suitable for energy-constrained WSN scenarios and for energy-neutral applications. Stefano Basagni, Chiara Petrioli and Dora Spenza, CTP-WUR: The Collection Tree Protocol in Wake-up Radio WSNs for Critical Applications. In Proceedings of IEEE ICNC 2016, Kauai, Hawaii, Feb 2016. Allowing the nodes of a wireless sensor network (WSN) to turn their radio off periodically noticeably increases network lifetime. Duty cycling, however, does not eliminate idle listening, comes at the price of longer latencies and obtains lifetimes that are still insufficient for many critical applications. Using a wake-up receiver (WUR) allows actual communications on the main radio only for transmission or reception, virtually eliminating node idling. However, the range of current WUR prototypes is still significantly shorter than that of the main radio, which can challenge the use of existing WSN protocols in WUR-based networks. In this paper we present an approach to mitigate this limitation of wake-up-based networks. In particular, we show that the Collection Tree Protocol (CTP), a standard protocol for data gathering in WSNs, suitably redefined to work on WUR-endowed nodes, achieves lifetimes of several decades. This constitutes a remarkable improvement over duty cycle-based solutions, where CTP makes the network lasts only a handful of months. At the same time, our WUR-based approach obtains data latencies comparable to those obtained by keeping the main radio always on. Dora Spenza, Michele Magno, Stefano Basagni, Luca Benini, Mario Paoli and Chiara Petrioli, Beyond Duty Cycling: Wake-up Radio with Selective Awakenings for Long-lived Wireless Sensing Systems. In Proceedings of IEEE INFOCOM 2015, Hong Kong, 26 April - 1 May, 2015, pp. 522 - 530. Emerging wake-up radio technologies have the potential to bring the performance of sensing systems and of the Internet of Things to the levels of low latency and very low energy consumption required to enable critical new applications. This paper provides a step towards this goal with a twofold contribution. We first describe the design and prototyping of a wake-up receiver (WRx) and its integration to a wireless sensor node. Our WRx features very low power consumption (lower than 1.3uW), high sensitivity (up to -55dBm), fast reactivity (wake-up time of 130us), and selective addressing, a key enabler of new high performance protocols. We then present ALBA-WUR, a cross-layer solution for data gathering in sensing systems that redesigns a previous leading protocol, ALBA-R, extending it to exploit the features of our WRx. We evaluate the performance of ALBA-WUR via simulations, showing that the use of the WRx produces remarkable energy savings (up to five orders of magnitude), and achieves lifetimes that are decades longer than those obtained by ALBA-R in sensing systems with duty cycling, while keeping latencies at bay. Chiara Petrioli, Dora Spenza, Pasquale Tommasino and Alessandro Trifiletti, A Novel wake-up Receiver with Addressing Capability for Wireless Sensor Nodes. In Proceedings of the 10th IEEE International Conference on Distributed Computing in Sensor Systems, IEEE DCOSS 2014, Marina del Rey, USA, May 26-28, 2014, pp. 18-25. Emerging low-power radio triggering techniques for wireless motes are a promising approach to prolong the lifetime of Wireless Sensor Networks (WSNs). By allowing nodes to activate their main transceiver only when data need to be transmitted or received, wake-up-enabled solutions virtually eliminate the need for idle listening, thus drastically reducing the energy toll of communication. In this paper we describe the design of a novel wake-up receiver architecture based on an innovative pass-band filter bank with high selectivity capability. The proposed concept, demonstrated by a prototype implementation, combines both frequency-domain and time-domain addressing space to allow selective addressing of nodes. To take advantage of the functionalities of the proposed receiver, as well as of energy-harvesting capabilities modern sensor nodes are equipped with, we present a novel wake-up-enabled harvesting-aware communication stack that supports both interest dissemination and convergecasting primitives. This stack builds on the ability of the proposed WuR to support dynamic address assignment, which is exploited to optimize system performance. Comparison against traditional WSN protocols shows that the proposed concept allows to optimize performance tradeoffs with respect to existing low-power communication stacks. Alessandro Cammarano, Dora Spenza and Chiara Petrioli, Improving Energy Predictions in EH-WSNs with Pro-Energy-VLT. In Proceedings of ACM SenSys 2013, Poster Session, Rome, Italy, 11-14 November, 2013, pp. 41:1-41:2. The increasing popularity of micro-scale energy-scavenging techniques for wireless sensor networks (WSNs) is opening new opportunities for the development of energy-autonomous systems. To sustain perpetual operations, however, environmentally-powered motes must adapt their workload to the stochastic nature of ambient power sources. Energy prediction algorithms, which forecast the source availability and estimate the expected energy intake in the near future, are precious tools to support the development of proactive power management strategies. In this work, we propose Pro-Energy-VLT, an enhancement of the Pro-Energy prediction algorithm that improves the accuracy of energy predictions, while reducing its memory and energy overhead. David Benedetti, Chiara Petrioli and Dora Spenza, GreenCastalia: An Energy-Harvesting-Enabled Framework for the Castalia Simulator. In Proceeding of the ACM 1st International Workshop on Energy Neutral Sensing Systems, ACM ENSSys 2013, Rome, Italy, 14 Nov, 2013, pp. 7:1-7:6. The emergence of energy-scavenging techniques for powering networks of embedded devices is raising the need for dedicated simulation frameworks that can support researchers and developers in the design and performance evaluation of harvesting-aware protocols and algorithms. In this work we present GreenCastalia, an open-source energy-harvesting simulation framework we have developed for the popular Castalia simulator. GreenCastalia supports multi-source and multi-storage energy harvesting architectures, it is highly modular and easily customizable. In addition, it allows to simulate networks of embedded devices with heterogeneous harvesting capabilities. 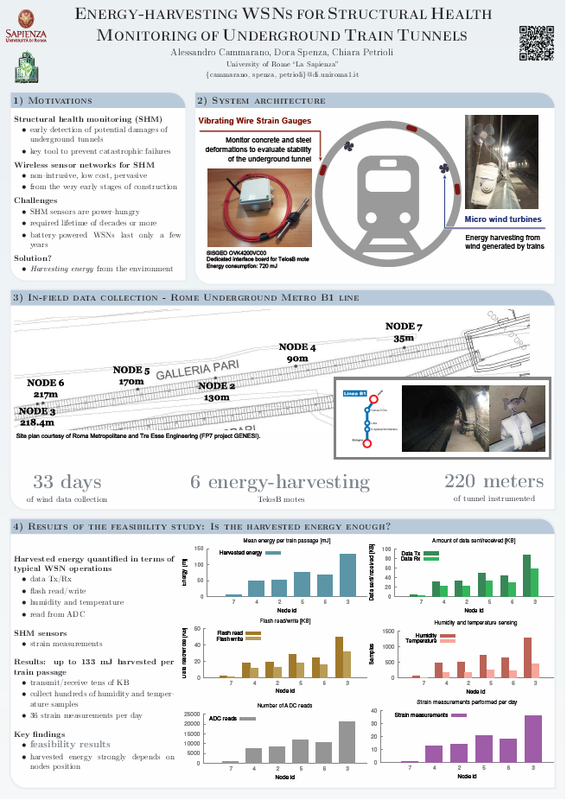 Alessandro Cammarano, Dora Spenza and Chiara Petrioli, Energy-harvesting WSNs for structural health monitoring of underground train tunnels. In Proceedings of IEEE INFOCOM 2013, Student Session, Turin, Italy, 14-19 April, 2013, pp. 75-76. Best Student Poster Award. Alessandro Cammarano, Chiara Petrioli and Dora Spenza, Pro-Energy: a novel energy prediction model for solar and wind energy harvesting Wireless Sensor Networks. In Proceeding of the 9th IEEE International Conference on Mobile Ad hoc and Sensor Systems, IEEE MASS 2012, Las Vegas, 8-11 Oct, 2012, pp. 75-83. Chiara Petrioli and Dora Spenza, Pro-Energy: a novel energy prediction model for solar and wind energy harvesting WSNs. Presented at the N2Women Workshop, IEEE INFOCOM 2012, Orlando, 26 March, 2012. Thomas La Porta, Chiara Petrioli and Dora Spenza, Sensor-mission Assignment in Wireless Sensor Networks with Energy Harvesting. In Proceeding of the 8th IEEE Communications Society Conference on Sensor, Mesh and Ad Hoc Communications and Networks, IEEE SECON 2011, Salt Lake City, 27-30 June, 2011, pp. 413-421. Sensor mission assignment concerns matching the sensing resources of a wireless sensor network (WSN) to appropriate tasks (missions), which may come to the network dynamically. Although solutions for WSNs with battery-operated nodes have been proposed for this problem, no attention has been given to networks whose nodes have energy harvesting capabilities, which impose quite a different energy model. In this paper we address this problem by providing both an analytical model and a distributed heuristic, called EN-MASSE, for energy harvesting WSNs. The objective of both model and EN-MASSE is to maximize the profit of the network, fully exploiting the harvesting technologies, while ensuring the execution of the most critical missions within a given target WSN lifetime. The performance of EN-MASSE is evaluated by simulations based on real solar energy traces. Our experiments show that EN-MASSE behaves very closely to the optimum provided by our model and significantly outperforms previously proposed solutions. Dora Spenza, Towards Self-Powered Wireless Sensor Networks. PhD thesis, University of Rome "La Sapienza", 2013. Ubiquitous computing aims at creating smart environments in which computational and communication capabilities permeate the word at all scales, improving the human experience and quality of life in a totally unobtrusive yet completely reliable manner. According to this vision, an huge variety of smart devices and products (e.g., wireless sensor nodes, mobile phones, cameras, sensors, home appliances and industrial machines) are interconnected to realize a network of distributed agents that continuously collect, process, share and transport information. The impact of such technologies in our everyday life is expected to be massive, as it will enable innovative applications that will profoundly change the world around us. Remotely monitoring the conditions of patients and elderly people inside hospitals and at home, preventing catastrophic failures of buildings and critical structures, realizing smart cities with sustainable management of traffic and automatic monitoring of pollution levels, early detecting earthquake and forest fires, monitoring water quality and detecting water leakages, preventing landslides and avalanches are just some examples of life-enhancing applications made possible by smart ubiquitous computing systems. To turn this vision into a reality, however, new raising challenges have to be addressed, overcoming the limits that currently prevent the pervasive deployment of smart devices that are long lasting, trusted, and fully autonomous. In particular, the most critical factor currently limiting the realization of ubiquitous computing is energy provisioning. In fact, embedded devices are typically powered by short-lived batteries that severely affect their lifespan and reliability, often requiring expensive and invasive maintenance. In this PhD thesis, we investigate the use of energy-harvesting techniques to overcome the energy bottleneck problem suffered by embedded devices, particularly focusing on Wireless Sensor Networks (WSNs), which are one of the key enablers of pervasive computing systems. Energy harvesting allows to use energy readily available from the environment (e.g., from solar light, wind, body movements, etc.) to significantly extend the typical lifetime of low-power devices, enabling ubiquitous computing systems that can last virtually forever. However, the design challenges posed both at the hardware and at the software levels by the design of energy-autonomous devices are many. This thesis addresses some of the most challenging problems of this emerging research area, such as devising mechanisms for energy prediction and management, improving the efficiency of the energy scavenging process, developing protocols for harvesting-aware resource allocation, and providing solutions that enable robust and reliable security support. Copyright Notice: Permission to copy without fee all or part of this material is granted provided that the copies are not made or distributed for direct commercial advantage. To copy otherwise, or to republish, requires a fee and/or specific permission of the ACM/IEEE. Member of the organizing committee of IEEE IQ2S 2017, ACM WUWNet 2014, IEEE WiNMeE 2014, ACM Sensys 2013. Member of the Technical Program Committee of IEEE ICC 2017, IFIP/IEEE Wireless Days 2017, IEEE ICNC 2017, ACM ENSsys 2016, N2Women Workshop 2016, OMNeT++ Summit 2016, IEEE Globecom 2016, IEEE ICC 2016, IFIP/IEEE Wireless Days 2016, IEEE ICNC 2016, IEEE CCNC 2016, ACM ENSsys 2015, IEEE ICC 2015, IEEE WoWMoM 2015, IEEE ICNC 2015, ACM ENSsys 2014, IEEE WoWMoM 2014, EuCNC 2014, SuMo-CPS 2013.